Sunday morning: boats are packed, charts consulted, forecasts reviewed and decisions made. The possibility of a hard slog into a building headwind is accepted as a manageable risk. 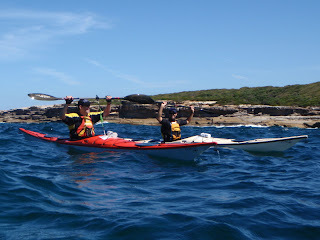 If conditions get too strong too early our "plan b"will involve a downwind run into Wattamolla. Our first break is just after rounding Jibbon Head. From here we can see the bombora seething occasionally. Today we can safely run the gap between the cliffs and reef, and head south down the cliffs to Marley. We check out the surf at Big Marley before a soft landing at Little Marley for lunch. On the way home we practice rescues, rolling, and controlling our boats in the building breeze. The group have never paddled the seacliffs of "The Royal" before and they are suitably impressed with the backdrop for today's training.